Well, well, well, look what we have here. Yet another Thursday under our belts, which means tomorrow must be Jeans Day! It looks like this weekend is going to be grey and wet, with a nap index that’ll be through the roof! What better way to spend those dreary days than wrapped up like a BURRITO! Merriam-Webster dictionary defines ‘burrito’ as “a flour tortilla rolled or folded around a filling”. Tortilla = blankie. Filling = YOU. I hope the inventor of this blanket won a Nobel Prize for this idea. THAT is doing some good in a world that sometimes feels like eating the last few bites of a huge burrito — A DAMN MESS. I didn’t make this image, but I wish I did. I cannot count the number of times I have closed my eyes and held a warm burrito against my body pretending it was the warmth of another human. HAHAHA, JUST KIDDING!!! I want a burrito so bad now. An actual burrito. That’s not a metaphor or euphemism for anything, just… nevermind. <– Cutetitos?! What the actual F?! Is it true that all you have to do to work at a toy company is micro-dose on magic mushrooms and then spitball your “inspired” ideas around a boardroom table?! Because that’s what it seems like! And I imagine the same goes for coming up with most kids’ cartoons. Also, the Jeans Day Weekly will be on a two-week vacation, so you will have to keep track of Fridays are on your own for a bit. BYYYEEEEE! It’s a bright and sunny Thursday afternoon. Perfect for celebrating Respect Your Cat Day and tomorrow being Jeans Day! I’m more of a dog person myself, but really just I love animals. And while I dream of a more open-minded and tolerant world, accepting of the pet-friendly office, in our current occupational climate, that is unfortunately just not our reality. But this is the Jeans Day Weekly and reality is not a thing here! So here is your cat-friendly office dream sequence. Your morning commute is slow because you are stuck in that Highway 1 traffic. Except that today you get to use the HOV lane because you have a passenger. Burt loves going to work with you! You wish you shared this sentiment, but alas, it’s Monday. You and Burt arrive at the office and head to the kitchen to get a cup of coffee and catch up on all the hot goss from the office chatter boxes around the water coolers. There are three water coolers in this dream sequence because everyone is very dedicated to being hydrated. Oh jeez, so much filing to do today. Wait a sec, Lieutenant James T. Claw, already did it all and is now taking a snooze in your filing thing?! Such a helpful little soldier. Ah, but there are many other things to do today. Now where are my pens and that to-do list I made…. Gary keeps your desk organized better than any pen cup ever could, and you can always rely on Taylor to prioritize all your deadlines. Calista the rescue cat! As in, she’s rescuing YOU from tech distress. And at the end of the day, when the clock strikes 5, you know you have to go home because Storm does not like you working overtime. This little rain cloud is just looking out for your own well-being. And making sure you shut down your computer so it can install new updates. And off you go, commuting home in the HOV lane… happily ever after. The end. So relaxing, right?! Now get back to work! The reality is it’s only Thursday and there are no pets allowed here. HAPPY SPRING TIME!! Mmmm, it feels so good. And guess what tomorrow is?! Another glorious JEANS DAY! Tomorrow is National Goof Off Day, a day I celebrate weekly it seems, and Saturday is National Puppy Day. So to commemorate these two very important occasions, this week’s Jeans Day Weekly is a celebration of GOOFY PUPPIES! And before anyone mentions that Disney’s Goofy fits this description to a tee, I ventured down the internet rabbit hole of “Is Goofy a dog?”, “If Goofy is a dog, and Pluto is a dog, then why can’t they both walk and talk?”, and “Goofy is the only Disney character who has a kid, which means…” – and I emerged feeling disturbed about my feelings on Goofy. So I’m leaving that for a chat with my therapist instead. I relate too well with this dog. There isn’t a bakery in town whose windows I haven’t tasted in an attempt to sample the goods within. It is not effective. But I will never stop. Sorry if this image makes you crave donuts. If anyone wants to go slobber on the windows at Cartems, you know where to find me. Do I relate to this dog too?! YES. If the meal was tasty, you better believe I’ll lick my dishes clean to get every last bit of that delicious dish. Maybe I’m just too AMAZING a cook. (Not likely) Also, I don’t have a dishwasher, so really I’m just doing my future self a favour by a pre-washing. This dog gets that and is taking initiative. Just LOOK at this tiny puppy living out her dream! How’d she get in there?! I can’t even! What a clever little rascal. While I’ve never actually jumped into my food, I have dreamt about it. Swimming in a pool of guacamole (at no extra charge), or rolling down a mountain of donuts in my mansion’s vault a la Scrooge McDuck. Those dreams are the best. Now if only I could have more of those dreams, and fewer wandering-in-a-parkade dreams. Someone analyze me. Hmmm, also relate to this stupid-face because I also cannot pose properly for a picture. HAHA, look at that face! I want to kiss this derp-nugget right on the snoot. Oh. My. Goodness. This little idiot apparently has a very strong opinion on baths. Or maybe just a deep affection for vintage yellow tubs? Either way, a strong opinion. And great plank pose. Probably has a killer CORE. What even is this?! Was that a sentence? I’m at a loss for words. Who and why and how? Strong brow game. HAHAHA! My little bumble bees! I’m so sorry I forgot to send this yesterday so you probably forgot that today is Friday Jeans Day… sometimes my damn job gets in the way. Sunday is St. Patrick’s Day and I, for one, am not into Granville Street shenanigans, but will instead be celebrating another Patrick….SIR PATRICK STEWART! I mean, yeah, he looks great in jeans, but that’s not why we all love him (we all love him, by the way). Especially if you’ve seen this picture of him performing as Oberon the fairy king in A Midsummer Night’s Dream. WOW, such…talent! He really emBODIES the role. That was in the 70s, and he STILL was mostly bald. Just another reason to love him – he makes being bald COOL! He also dressed in drag for a TV appearance which was both hilarious and very, very terrifying. This is when you wish your TV wasn’t HD. Yikes. He’s a classically trained Shakespearean actor AND he’s got a great sense of humour. If you haven’t seen him on Ricky Gervais’ old show Extras, it’s a HILARIOUS episode. They all are. He also has a very deep and very real bromance with Sir Ian McKellen. They have been BFFs since meeting on the first X-Men movie in 1999 and they call each other “Sir Ian” and “Sir Patrick”, as all British knights do. And they kiss on the lips. DEAL WITH IT. Sir Patches will kiss anyone, even Conan. So this Sunday, raise your glasses to Sir Patrick — the greatest Patrick of them all! Guess what?! Tomorrow is INTERNATIONAL WOMEN’S DAY! So the theme of this week’s Jeans Day Weekly is a Celebration of Queens in Jeans! Beauty Queens and Rodeo Queens, simultaneously making the world a little prettier and taming cranky old studs. Celebrate the Hard-Working Mom Queens – we all have them, and maybe you are one, biological or otherwise, and they’ve SAVED OUR DAMN LIVES on the regular. And the Business Queens who spend their days slamming their hands onto desks and fighting for causes they believe in. And also Drag Queens who make our lives more colourful, and our makeup routines far more complicated. And for the Transgender Queens for reminding us that womanhood is individual, and that it doesn’t matter what’s going on in your swimsuit areas because, really, that ain’t nobody’s business! Celebrate for the Refugee Queens who are new to this land and the Indigenous Queens who we share it with, all fighting for the chance for their families and loved ones to be safe and free from oppression. To all the Cis Queens, Queer Queens (Queerns! ), the rich and poor Queens, and the entire vast spectrum of self-identifying women in every single culture who are making the world a better place for us all to call home. Read more about some fascinating, amazing (mostly) Canadian women here! It’s not us against the world, we’re all in this together, equally. HAPPY INTERNATIONAL WOMEN’S DAY!! That springtime is nearing and winter may leave. Goodbye jackets, umbrellas, and traffic head-pains! Out snow pools! Out rain piles! Come sunshine again! If you love peanut butter you’ll be over the moon! On green eggs and ham! Huzzah, what a treat! So come join the party! Hurry your flip floppy feet! Celebrating his birthday on exactly this day? Blows out 25 candles on a cake made of cheese! The Doctor named Seuss, who made books so sublime. Good Thursday to you all! Get ready for another JEANS DAY tomorrow in celebration of it being National MARGARITA DAY! So I’m providing you with some wardrobe inspiration. Did you think I was going to say “providing you with some margaritas”? Sorry no, but I WISH! When you think of margaritas, it’s hard not to start humming “Margaritaville” to yourself. Those airy, bouncy notes are just as intoxicating and nauseating as tequila itself. Music that invokes a reckless position on fashion inspired by parrots, and an outlook on life as carefree as parrots. It’s a very parrot-centric lifestyle. Their colours, the trees they call home, the fruits they eat, their disregard for the time of day that is appropriate to get hammered (parrots are notorious partiers). What’s in that lady’s travel mug? Parrot juice (AKA a margarita). Why is that guy hanging loose with a Corona? Well obviously he’s going to turn it upside-down into a margarita making it a Bulldog. And why is that man walking down the beach with such a smile on his face? It’s 1:00 pm and he’s smashed. Already lost his shoes. Probably going to fall asleep on the beach and get SUCH a sunburn. And just look at that jean jacket. Quelle surprise — PARROT. Would it thrill you to know that there is a musical based on Jimmy Buffet songs called “Escape to Margaritaville”? No? Well what if I told you that it debuted on Broadway just last year? Still no? Ok, what if I informed you that the critics proclaimed it “insufferably dumb”, “an empty shell”, and “don’t expect too much”? Yeah, now we’re all on board! Speaking of escaping Margaritaville, we had to do some online security awareness modules here at the business workplace, and I got to meet these two boneheads fresh off their Air Transat flights. I kid you not, these are 100% REAL from the videos. First up, the “unqualified family member”. Carrying his backpack on ONE shoulder and flip flops to the office without a care in the world. What’s that around your neck, a shark tooth? An ancient amulet? I don’t even care, get a haircut, kid! The only thing this guy lacks is a parrot in some form, but his mindset is already there. His wardrobe went from business black & white to garish patterns & colours because he “now disregards work policies”. What an absolute dickhead. As we are being led to believe, if you wear colour and have ever so slightly disheveled hair, you’re a threat to security. THIS is what real criminals look like, people! Ok… so maybe today I’m wearing what can only be described as “a lot going on” and have messy hair, but don’t worry about it. Nothing suspicious here. Just send me all your passwords, ok? Happy Thursday / Valentine’s Day / Jeans Day Eve everyone! Tomorrow we wear jeans to celebrate the Family Day long weekend. Because families who jeans together, have…genes…together…. I dunno. Hey, did you notice that polar vortex thing that happened this week? Well worry no more because the culprit of these cold, wintery conditions has been apprehended. Queen Elsa of Arendelle was taken into police custody early last week after police in Hanahan, South Carolina caught her at a truck stop on the lam from Illinois police. She was wanted across the continent for having temper tantrums in the form of winds howling like the swirling storm inside her adolescent heart. They caught her before she could let the storm rage on, but unfortunately, she left quite an icy trail of ruin in her path. What a snarky troublemaker. In an attempt to warm each other’s hearts, people in the Midwest USA started this trend on social media, which is right up my alley, called the Frozen Pants Challenge. It involves hanging wet jeans out on a clothesline until they’re frozen and then posing them on your front lawn. Haha, they’re like ghosts in pants! How hilariously terrifying. That poor mail carrier. And a special Valentine’s treat for you all – Look! It’s Durex jeans. Let the pheromone storm rage on. The cold never bothered you anyway. 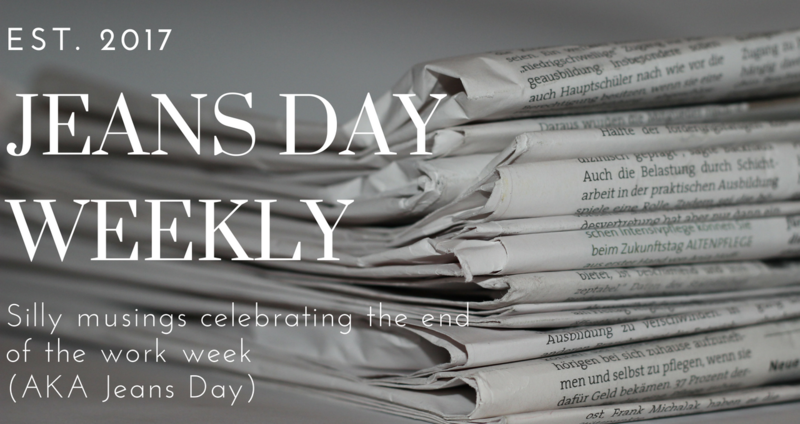 Welcome to the February 7th edition of the Jeans Day Weekly! Tomorrow is JEANS DAY and you get to wear your crispest blues to work. Once upon a time, in a land not unlike a Disney fairytale, but also like a Leonard Bernstein musical, there lived a tiger named Tiger and her three little piglet wards. The piglets befriended Tiger after each of their HAND BUILT houses had been blown down by a malicious wolf, and Tiger, a strict vegetarian, swore she would keep the piglets safe. The piglets greatly appreciated Tiger’s protection, as well as her exquisite vegetarian cooking. They became so close that they even started dressing the same AND got matching tattoos! One day, the tiniest of the piglets, Albert, decided that he was ready to move out of Tiger’s den to try to make a name for himself as a classical Shakespearean actor like his idol Patrick Stewart. In an effort to find his own sense of style, he went shopping and began trying out different looks. One of his favourites was his Western wear. It made him feel like a pig of the land, and gave him the confidence to get into – that’s right – cosplay. Albert dressed up as Harry Pigter’s Dumbleboar, Swinederella, and Minnie Sow (just to name a few) for various comic-con events. As you can tell, Albert does not believe in the traditional gender “norms” of modern society. He does whatever makes him feel happiest. And although a far cry from acting, Albert felt like cosplay was what he was actually meant to do and made him happiest. After all, there is no shame in having ever-evolving dreams and ambitions. Anyway, after several years doing the comic-con circuits, Albert eventually decided to return to his roots. He purchased a 20 acre farm outside the city of Saskatoon where he settled into a relaxed life of jeans and suspenders with his life partner Puff the Squirrel. Happy Thursday! And the last day of January….WHAT?! The only time of year that Pepsi seems to be winning the popularity contest over Coca Cola is during the Super Bowl. Remember these iconic commercials? BEYONCE: I’m sorry, do what with this can of poison? BRITNEY: Do you have any Coke? DIRECTOR: *sigh* No. Just pretend like you drink Pepsi all the time. I don’t have any dialogue for this. Cindy is probably just daydreaming about whatever it is that beautiful people daydream about. Jewels, maybe? Haute couture fashion? Taking a bubble bath and sipping champagne surrounded by marble? Is there anything cuter than Betty White playing football with the guys? Nope. But then she eats a Snickers and she’s magically transformed back into a young guy who was just a little hangry. Women of the world, just THINK about what we could accomplish by eating more Snickers bars and transforming from frail ladies into young able-bodied men! Oooooooooo, political. No, that’s not actually the message of their ad campaign, I’m just being a difficult woman. Blame my erratic hormones. Still one of my all-time favourite commercials – Old Spice. This commercial apparently just skyrocketed this guy into fame. I mean, 15 minutes of commercial brand fame touring night clubs, but that’s still a kind of fame. But when Old Spice realized that people responded well to ripped abs, they went to the EXTREME and hired Terry Crews instead. And you can’t go up from there. The Budweiser “Wazzap” commercials of 1999 – 2002 could be considered iconic, but mostly they were also just THE WORST. Remember how anyone in their teens and 20s would answer the phone with an obnoxious “WAZZAAAP? !” We were so annoying. I’m sorry to have brought this up again. I’m a bad person. Well these are cute! Fantasy football helmets. Ha, get it?! Ok, I’m done. GO TEAMS!